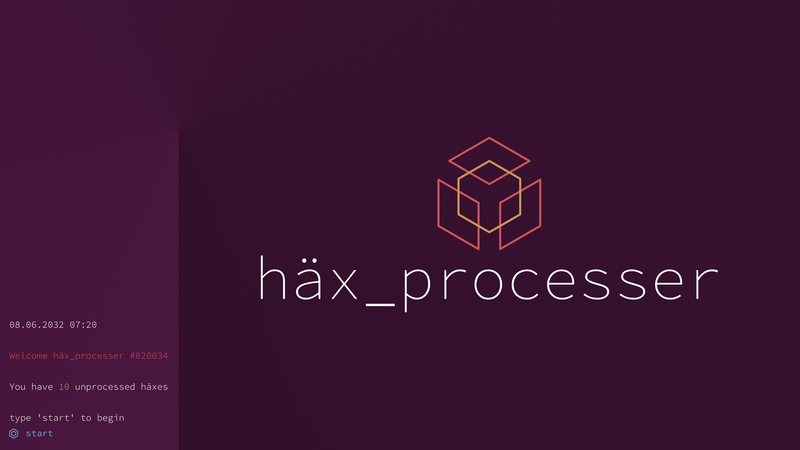 As a häx processer, your task is to process häxes using our state-of-the-art, in-house Häx Processor. It is a tough job, but it needs to be done. Your mother was one of the best in the business. Make her proud. Welcome to the family. Move, rotate and zoom one or more geometric shapes to reveal häxes. The häxes can be hexagons, hexagrams, and various symbols of the hex, such as pentagrams. You need to overlap the shapes with the target pattern to proceed to the next häx. You manipulate the shapes using text commands. In the early stages, you solve the puzzles using basic operations on individual objects, but things get more complicated later on. 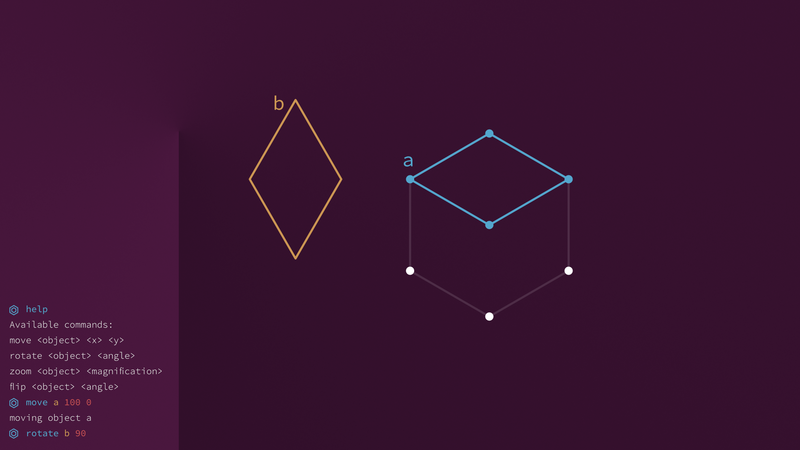 For example, you may have to rotate the shapes in 3D or deal with interconnected and mirrored shapes that respond to the same commands. My original inspiration for the game was the Enhance scene from Blade Runner. My goal is to make eyeballing the correct command and seeing the shapes align feel as satisfying as possible. I don't want to copy the visual style of the Blade Runner scene, because I know I cannot nail it within this time frame, but I will definitely try to produce some version the cool step-wise chak-chak-chak transition from the start position to the final one. I chose a relatively simple concept for the game as I'm not sure how much time I can dedicate to coding this time. I don't expect major problems with the basic functionality, except maybe in the proper recognition of correct solutions, but I know to expect the unexpected. I think the major obstacle time-wise will be making interesting levels because purely procedurally generated ones will get boring very soon. This will be my third Wizard Jam game and third game overall, and I'm super excited to start working on it as well as seeing what everyone else comes up with. I love the look of this (nice logo btw) and the game concept sounds interesting too. Good luck @Nappi! Oooh, another elegant-looking (and fun, I'm sure) game by Nappi. Looking forward to playing this! My excitement for this is tremendous. Also, great use of a Something True title. Looking forward to this as well, I like your aesthetics very much! I really love the aesthetic. Super crisp. As far as gameplay, there's only a couple images to go on, so maybe I'm not 100% grokking it, but I feel like playing that game will be an exercise in frustration for me. This seems like the kind of games people with good art skill and visual acuity play and are like "oh, this obviously goes here and here" and I'm like "How the heck can you tell???". Basically, like the Witness's color levels. Which, all things considered is a pretty good thing to be compared to. Which is not to say I don't think it'll be cool. Just that I may watch someone else play it, because I don't think I'll be very good. Thank you all! I will try to live up to the mockup. Koholos: I definitely get that the gameplay might not be for everyone. Just to clarify, my plan is not to limit the number of moves or the time to complete each puzzle, i.e. 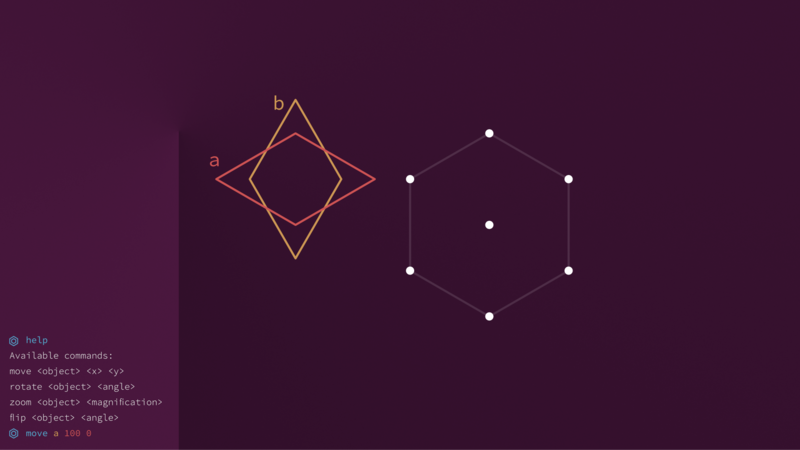 you can align and realign the shapes as long as you want*. My goal is to come up with puzzles where the solutions are not very obvious so that once you finally get it right, you feel satisfied. However, puzzle design is hard, so we will see. * Though I admit that because I deliberately chose a very obnoxious user interface as the key component for the game, people might not want to experiment for very long. This is why I plan to keep the number of moving parts at a manageable level. Beautiful style and a cool idea! Good luck! Didn't have time to work on this as much as I would have wanted over the weekend weekend, but I managed to get the polygon drawing and the command interface done. I spent quite a lot of time on really important stuff like as-you-type syntax highlighting. After I have implemented the text log, I can focus on the actual gameplay. In addition to everything else, I think this could make for a good program to teach coding. You could go that way if the user had the option of queueing all the moves then executing them all at once. Related: I forgot how satisfying the bleeps and boops of the Esper analysis computer thing are. You are right. I'll see if I have time to extend this beyond the single line execution within the period of the Jam. I was already thinking of including continuous versions of the transforms (e.g. object keeps rotating in 5 degree intervals) where you have to manually stop the movement. 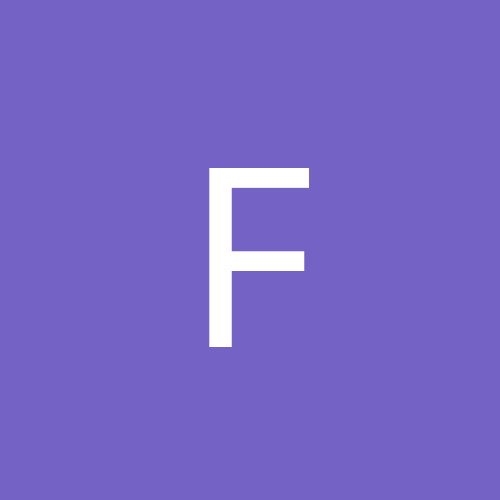 This could be used as a quality of live thing, as a challenge (only continuous versions of the commands available on certain levels) or as a requirement to complete the level (e.g. the target shape rotates and you have to match the movement). You bet that I have already looked into voice activation! It seems that Unity has a voice recognition system that works in Windows 10. I hope I will have time to play around with it. The basic implementation seems relatively straightforward, but I bet that getting it to work somewhat reliably will take a lot more effort. Regarding the Esper soundscape: Audio feedback is so important. Entering commands and watching them being executed feels pretty boring without sounds. I added some placeholder clanks for the movement, and it feels better, but I still need to do a lot of work in terms of audio and visual feedback. The basic implementation seems relatively straightforward, but I bet that getting it to work somewhat reliably will take a lot more effort. Of course the goofy workaround to this that will still be fun: Just detect any noise of a certain threshold and consider that a command a la Famicon controllers. Cool gameplay concept! Will you be limiting the commands to fairly large increments - only using integers with the move command, for example? You could go that way if the user had the option of queueing all the moves then executing them all at once. This is an excellent idea, though it's understandable if it's beyond the scope of the project right now. 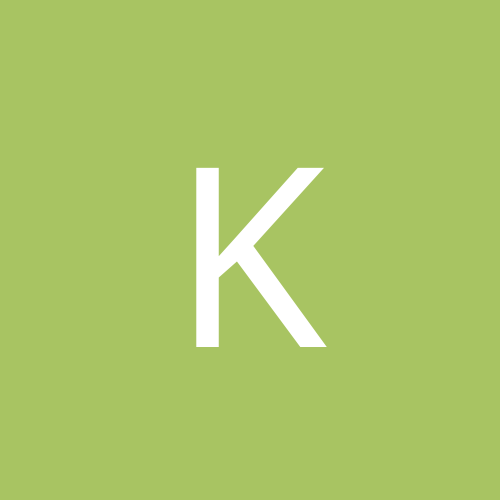 My current plan is not to limit the increments but to have a sizable margin in the solution recognition system so that players don't have to endlessly tweak the position. I will see what works the best once I'm a bit further. Did not make much visible progress today, as I focused on clarifying my code. I finished the terminal system, though, and added some placeholder audio. I will need to look for more interesting sound effects eventually. I quite like how 3D rotation looks in minimalistic 2D (the "flip" command). It is pretty disorienting too. I know it's not super important to the gameplay but I really like the contextual coloring of the code. Looking good! I'm experiencing pretty serious Jam fatigue and haven't been able to progress the game much after work. Fortunately, most of the basic elements are there already, and I think I will find the motivation again during the long weekend. I was not able to make as much progress as I would have liked to, because I was pretty burned out with work stuff. Nevertheless, the game is functional and there are 10+ levels. All haxes processed! Some of these were quite tricky, but I enjoyed the game a lot!